This is the last in the four-part series of use and usability design encountered while honeymooning - and I saved the, uh, "best," for last. Yup, that's a photo of the toilet "sub-room" of the bathroom in our suite - and from the design of it, I think they're counting on more intimacy (or at least familiarity) than should be assumed for many newlyweds. 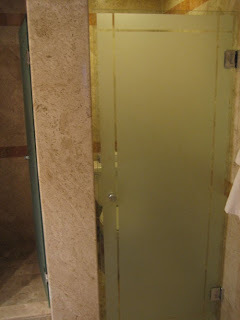 Note that the glass door (1) is non-frosted clear in several areas so that it's not a complete visual barrier, and (2) doesn't seal on any edges to the doorframe, allowing the transmission of, shall we say, olfactory and acoustic elements into the main bathroom. Yes, intimacy and sharing are wonderful - but sometimes you'd rather spare your mate from familiarity with everything you do! In this case: privacy, please! Oh Dave, you'll get over things like this when Jess gives birth to your child in a room of about 5-7 people, what with you, doctor, nurses, etc. There aren't too many privacy barriers after that. . .